(Hong Kong) -- Historic Chinese coins, now certified by Professional Coin Grading Service (www.PCGSAsia.com) for authenticity and grade, will be highlights of four auctions that will be conducted in conjunction with the April 2014 Hong Kong International Coin Convention and Antique Watch Fair (HICC). Auctions will be conducted by the show's organizer Ma Tak Wo Numismatic Company, Inc. jointly with A.H. Baldwin & Sons, Ltd.; Stack's Bowers and Ponterio; Rarehouse and by Spink & Son. "Collectors and dealers in Asia and around the world know that the PCGS certification helps maximize the value and the liquidity of their coins," said Mr. Don Willis, PCGS President. "PCGS is glad to participate to such vibrant auction scene. To see these rare coins in PCGS holders is a real market's endorsement of the value of our authentication and grading services!," explained Ms. Muriel Eymery, PCGS Vice President of International Business Development. PCGS experts will provide on-site authentication, grading and certification at HICC. Also, coins previously certified and encapsulated in PCGS holders can be re-holdered in the new, improved PCGS Tri-View holder at the special, discounted fee of only US$10. Coins can be submitted to PCGS during the pre-show, April 1 to 3 from 10 a.m. to 6 p.m. in Crystal Room 3 of the Holiday Inn Golden Mile in Hong Kong. All orders submitted during that time period will be ready for pickup on Sunday, April 6 and will need to be picked up at the PCGS booth. Submissions not picked up by Sunday, April 6, will be available at the PCGS Hong Kong Submission Center beginning on Monday, April 7. Coins also can be submitted to PCGS during the HICC Convention, April 4 to 6, at Bourse B, Booths #220 - 223 at the Holiday Inn Golden Mile. Submissions received by 5:00 p.m. Friday, April 4, will be available for pick up by the end of the show on Sunday, April 6. 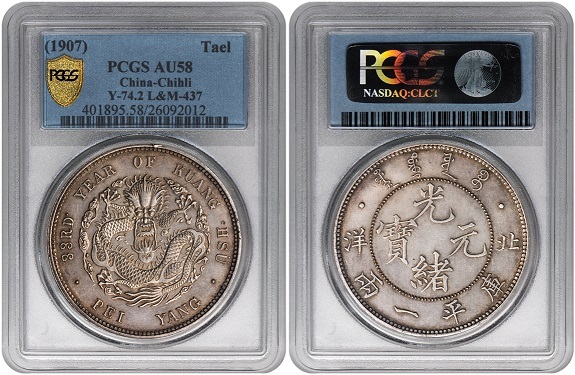 Highlights of the upcoming auction by Stack's Bowers and Ponterio (http://www.stacksbowers.com), March 31 and April 1, at the Mira Hong Kong Hotel include these PCGS-certified coins. Pattern Dollar Reverse Dragon Type I, Year 3 (1911). Tientsin Mint. L&M-32; cf.K-225; cf.KM-Pn308; cf.WS-0042B; Type I Incused veins on outer leaves. Graded PCGS SP-62 Secure. Pre-sale estimate: US$70,000 - $90,000. Pattern Dollar, Year 12 (1923). Tientsin Mint. Dragon and peacock. Large characters. Often referred to as the "Pu Yi Wedding Dollar." K&M-80; K-680a; Y-336. PCGS MS-66 Secure, the highest graded by PCGS or NGC. Pre-sale estimate: US$30,000 - $40,000. China/Provincial Chihli (Pei Yang). Tael, Year 33 (1907). Tientsin Mint.L&M-437; Chang Foundation-pg. 118#53; Wenchao-pg 414#633(rarity four star). Three dot type. One of the classic rarities of Chinese numismatics. PCGS AU-58 Secure. Pre-sale estimate: US$80,000 - $100,000. Central Mint, Kuang Hsu Silver Dollar, ND (1908) (L&M-11), PCGS MS67, the highest graded. Pre-sale estimate: US$120,000 - $200,000. Hupeh Province, Hsuan Tung Silver 10 Cents, ND (1909) (L&M-189), an extremely rare variety, formerly in the Ma collection. PCGS MS63. Pre-sale estimate: US$70,000 - $150,000. 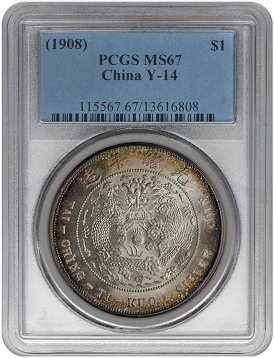 Yunan Province, Kuang Hsu Silver Dollar, ND (1907) (L&M-418), PCGS MS64 Secure, the highest graded. Pre-sale estimate: US$90,000 - $150,000. Central Mint at Tientsin: Silver Pattern 50-Cents, Hsuan Tung Year 3 (1911) (Kann 228; L&M 39; KM Y30, from the Åke Lindén Collection. PCGS SP63. Pre-sale estimate: US$10,000 - $15,000. Chekiang Province: Brass Pattern Cash, ND (1866), struck at the Paris mint, at the time of the Pin Mission, Obv Tong Zhi Tong Bao around circular central hole, 20mm (CCC 777; KM unlisted), and one of only four believed known. PCGS SP64+. Pre-sale estimate: US$20,000 - $25,000. Kirin Province: Silver Mace, Kuang Hsu, Year 10 (1884) (L&M 508; K 919; KM Y169) from the Åke Lindén Collection. PCGS AU55. Pre-sale estimate: US$15,000 - $20,000. Information about the Spink & Son auction in Hong Kong will be available soon online at https://www.spink.com/find-auctions.aspx. For additional information about the other auctions, contact the individual auction companies. For additional information about PCGS services, visit online at www.PCGSAsia.com, email [email protected], or call the PCGSHong Kong Submission Center at + 852 2194 6688.